Welcome to St. James Academy North County’s Premier Catholic School celebrating over 60 years of history. At St. James Academy, we are committed to inspiring students to fulfill their academic potential while instilling moral values, stewardship and Christ’s message into the fabric of each day. It is our mission to teach, care and nurture each child as if they were our own because at St. James Academy we are not just educators, parents and students – we are family. Saint James Academy facilitates early childhood education through its preschool program. The program is aligned with California state kindergarten preparedness standards. Our preschool functions as a gateway into the community. Our comprehensive program is aimed at maximizing learning through a STEAM based learning curriculum. The goal is to reach and teach each individual student. Our students are set up to achieve. Onward and upward. As our students advance towards high school, our focus is on preparedness for academic rigor and successful placement at choice schools. We balance our challenging work with fun that solidifies relationships that last a lifetime. We set high academic standards and challenge our students. In addition to STEAM and standard-based coursework, our curriculum includes music, religion, PE and Spanish. Additionally, our outdoor learning environment gives our students hands-on learning that directly relates to their academic studies. This well-rounded curriculum has proven effective, St. James Academy students score well above average in all standardized testing and in high school placement testing. From music and theater to painting and more, we have programs that enrich our students development in the arts. Our students perform and present their works throughout the county and have achieved honors and awards in the arts. We are especially proud of our music program which has provided students with the opportunity to perform at Carnegie Hall. We offer various athletic programs fully integrated with the school schedule, aiming at the complete development of the student, from preschool to 8th grade. For example, soccer practices are held on campus immediately after school. We are one of the few schools that has a surf team that gives our students the ability to develop a love for the sport and their parents the opportunity to volunteer. Whether it's on a soccer field or the beach and beyond, our sports program offers ample opportunities for personal growth. 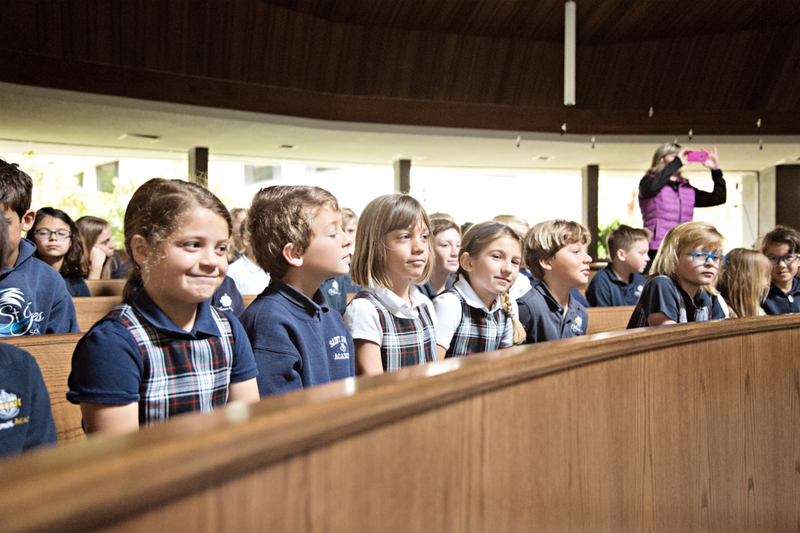 The Catholic Faith Community of St. James Academy weaves Christ's message into the fabric of each school day so that our children can develop in body, mind and spirit. Our program integrates spiritual, moral, academic, social, cultural and physical precepts. St. James Academy has a 16:1 faculty-student ratio. Our small class size facilitates deeper connections between faculty, families and students in a comfortable, supportive learning environment. At St. James Academy, you’ll build relationships that last a lifetime. Our Stewardship Program involves the entire school. Our “school families” comprise a mix of students from each grade. This environment facilitates a culture of support and community while helping raise leaders who treat others with a kind spirit and an emphasis on Jesus’ teachings. Our students are encouraged to participate in charitable programs and outreach opportunities to create awareness, help those in need or simply raise spirits. From the local homeless to soldiers abroad, St. James Academy actively organizes programs to bolster our student's commitment to Christ's teachings. St. James Academy is a California Green Ribbon School and has received bronze and silver recognition from the state of California. This award recognizes schools that demonstrate excellence in resource efficiency, health, wellness, environmental and sustainability education. St. James Academy's alumni include many whom have gone on to attend high schools of their choice and in turn some of the top universities in the country. Here are some of the testimonials we've heard over the years as we continue to follow in the footsteps of "A Higher Devotion to Excellence." "One of the greatest benefits of a St. James Academy education is the commitment of faculty to continued personal growth." "St. James Academy promotes a spirit of enthusiasm that fosters a sense of community thereby maintaining a strong Catholic mission." "They integrate Christian values into the curriculum, with an emphasis on spiritual development, positive approach to discipline and community building activities." "St. James Academy did an excellent job at incorporating a variety of supplemental texts, materials and methods to meet the needs of the students and their various learning styles!" Fill out the form below to schedule a tour. We look forward to hearing from you and introducing you to our family. A school ambassador will be reaching out to you to schedule your visit at your earliest convenience.